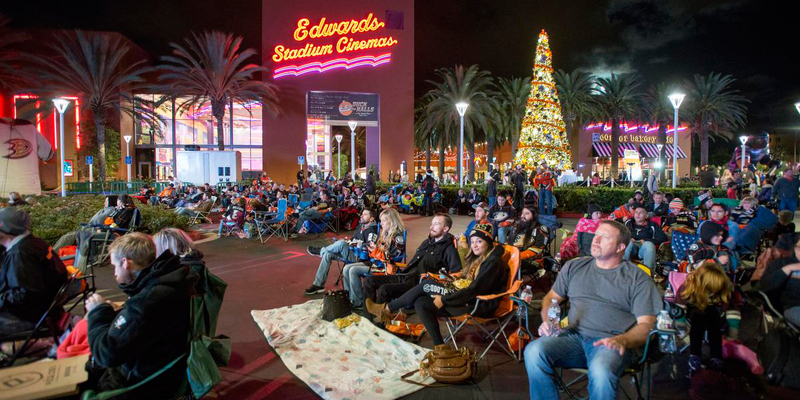 IRVINE, Calif. (Nov. 21, 2016) — The Anaheim Ducks will once again drop the puck this holiday season at The Market Place with three custom-designed holiday trees on display. Shoppers, families and friends are invited to join in on the festivities and check out the trees decorated in honor of the professional ice hockey team. Inspired by the Ducks, each of the 40-foot-tall trees captures a separate element of the beloved NHL franchise. The Market Place will showcase a Fan Tree, a Team Tree and a Wild Wing Tree complete with thousands of custom ornaments themed specifically for the Ducks and a one-of-a-kind, three-foot-tall glowing Wild Wing-inspired tree topper. The trees can be found at three areas: the Calfornia Pizza Kitchen Courtyard, Edwards Theater Courtyard and Lowe’s Food Courtyard. Each Saturday from Dec. 3 through Dec. 17, guests are invited to enjoy special holiday activities for kids from 2 to 4 p.m., including cookie decorating and games inspired by the season. Guests can also enter to win The Ultimate Fan Package of four (4) Ducks tickets and a $500 The Market Place gift card. Four prize packs will be given away. Visit www.HolidayStyleOC.com or call (714) 730-4124 for more details. One of Southern California’s most popular shopping centers, The Market Place is a 165-acre outdoor lifestyle shopping center offering the best-in-class in a variety of retail categories, including electronics, home furnishings and décor, sporting goods and more. Conveniently located off the Santa Ana (5) Freeway, the center straddles the cities of Irvine and Tustin. The Market Place features more than 120 stores and notable restaurants, including Nordstrom Rack, Best Buy, Target, Orange County’s largest REI, the county’s largest See’s Candies, Snooze, an A.M. eatery, Hopdoddy Burger Bar, Texas de Brazil, Wokcano, Starbucks Drive Thru, TAPS Fish Market & Brewery, Urban Plates and Bonefish Grill. For more information, please visit ShopTheMarketPlace.com. The Anaheim Ducks are now in their 24th season in the National Hockey League. The club was born in 1992 and played its first-ever game on Oct. 8, 1993 at Honda Center (then Arrowhead Pond of Anaheim). One of 30 NHL franchises located throughout the United States and Canada, the Ducks have played to over 90% capacity crowds in their history at the 17,174-seat Honda Center. On June 20, 2005, the Ducks franchise was purchased by Orange County residents Henry and Susan Samueli. By securing the first Stanley Cup championship in franchise history in 2007, the club also became the first team from California to win hockey’s ultimate prize. The Ducks have reached the Conference Finals four times (2003, 2006, 2007 & 2015) and the Stanley Cup Final twice (2003 & 2007). The club clinched its third consecutive Pacific Division title and fourth in franchise history (2007, 2013, 2014, & 2015) last season. Anaheim has qualified for the playoffs eight times in the last 10 campaigns.